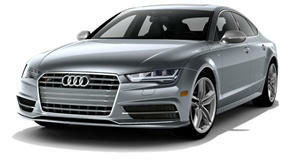 Ever since the current Audi A6 and A7 arrived, we've been patiently waiting for the more potent S6 and S7. We've spotted the S6 testing around the Nurburgring in sedan and wagon form and now both body styles have finally debuted alongside the S7 Sportback - well, sort of. 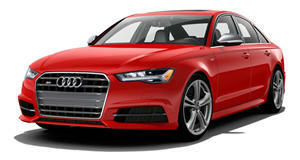 Audi has revealed the all-new S6 and S7 TDI, which will be European models only. Instead of the 450 horsepower twin-turbo V8 from the outgoing models, the S6 and S7 TDI are powered by a new 3.0-liter diesel V6 mated to a 48-volt mild hybrid system and an electric compressor (like the one found on the A6 and A7). This diesel mill produces 349 hp - just 19 more than the gasoline V6 in the A6 and A7 - but torque is a whopping 516 lb-ft. The electric supercharger works in tandem with the gas-driven turbocharger, delivering immediate power at low RPMs to eliminate any sensation of turbo lag. 0-60 mph takes just 5.0 seconds (5.1 in the S7 and S6 Avant) all while averaging around 32mpg (on the US scale). Even though Audi has quoted US mpg figures for the diesel, we will be getting a 2.9-liter turbocharged V6 engine (likely the same one found in the RS4 and RS5) producing around 450 hp. This engine will also be mated to an electric supercharged and a mild-hybrid system but Audi hasn't quoted any performance figures yet. We expect to see an announcement on the US-spec cars next week at the 2019 New York Auto Show. In terms of styling, Audi has added a touch of flare with larger wheels, more aggressive front and rear fascias, and Audi's signature silver mirror caps for its 'S' models. On the inside, the seats look sportier with optional diamond-quilting, which should dress up the otherwise understated cabin. We particularly love the S6 Avant, which is rumored to be coming to the US for the first time since 2003, though Audi didn't specify if all three body styles will be offered in the US. There will also be an RS6 and RS7 to sit above these models, producing over 600 hp.